"Enter X after name of person furnishing information." For the first time, we'll get to see who gave the information to the census enumerator. And if that person was not a member of the household, the enumerator was instructed: "If you find it necessary to obtain the information from a person who is not a member of the household, write the name of this person in the left-hand margin, opposite the entries for the household, thus: 'Information from John Brown, neighbor.'" Very cool. "In What Place Did This Person Live on April 1, 1935?" 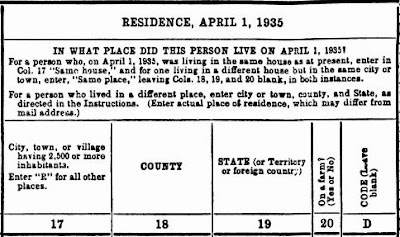 The census form states: "...For a person who lived in a different place, enter city or town, county, and State, as directed in the Instructions. (Enter actual place of residence, which may differ from mail address.)" Column 19 in this section asked for: "State (or Territory or foreign country)." We'll now know where someone was living half way between the 1930 and 1940 censuses, including if they were living outside the USA. Pretty cool. Ever wonder how much your ancestors made? The 1940 census should tell you. From the census form: "Amount of money wages or salary received (including commissions)." And: "Did this person receive income of $50 or more from sources other than money wages or salary? (Yes or No)." Leaving you to guess what those other sources might be. Also, the value of the home (if owned) or the monthly rent (if rented) is given in the "household data" section. So you'll get a little glimpse into your ancestor's economic life. Definitely cool.